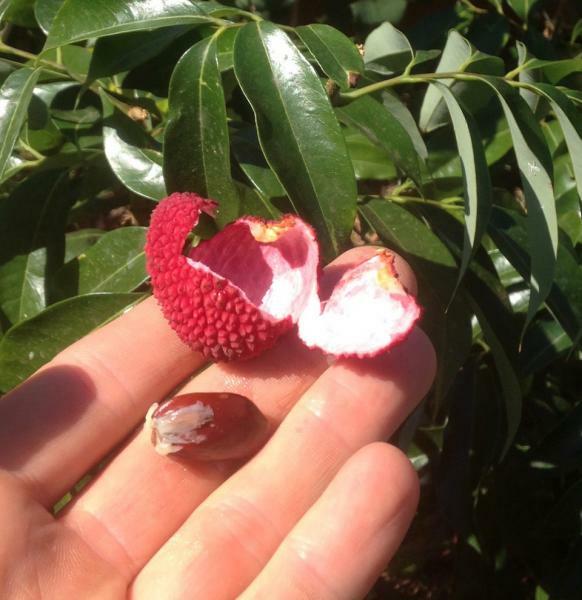 (click on underlined title to see more photos and info) Lychees / Litchis can do really well in the San Diego area in average diggable San Diego region soils. The variety in these photos is on a north facing slight slope aspect in the La Mesa / Spring Valley area. 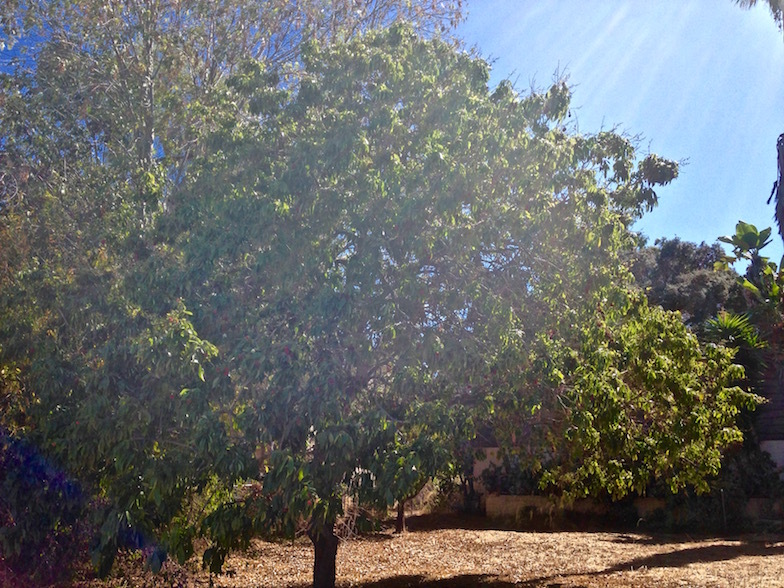 The tree is about 18' tall by 20' wide, with the trunk diameter about 10" wide near ground level. I estimate the age of the tree about 40 to 50 years old. It doesn't get much water other than rainfall. It gets no direct or intended or nearby irrigation, though the neighborlawn gets some irrgation but not much, and that's about 25' away on edge, and there are other kinds of tall trees making for more water competition. 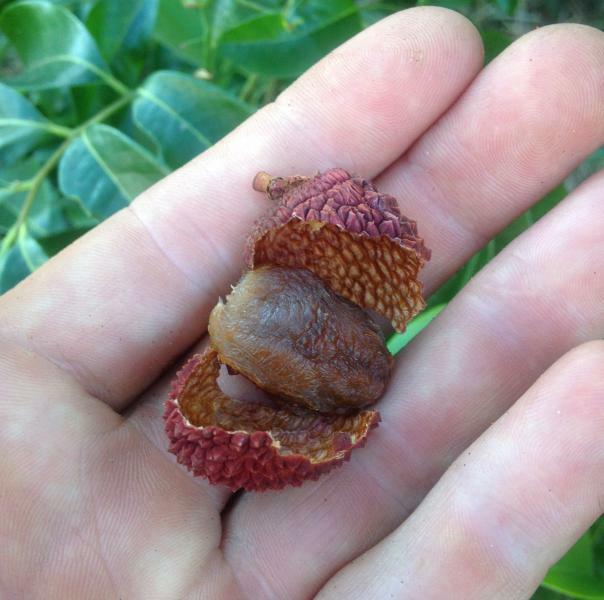 The fruit is a basic sweet subacid/low-acid sort, lightly rosy-floral-jasmine scented-flavored flesh, with a sizable seed, good fresh or dried, as shown in the pictures. It's a ratther heavy production tree most years. And plenty of fruit fallen on the ground because people aren't much harvesting the fruit,... but it's good eatin' fruit, quite enjoyable, sweet, and caloric. 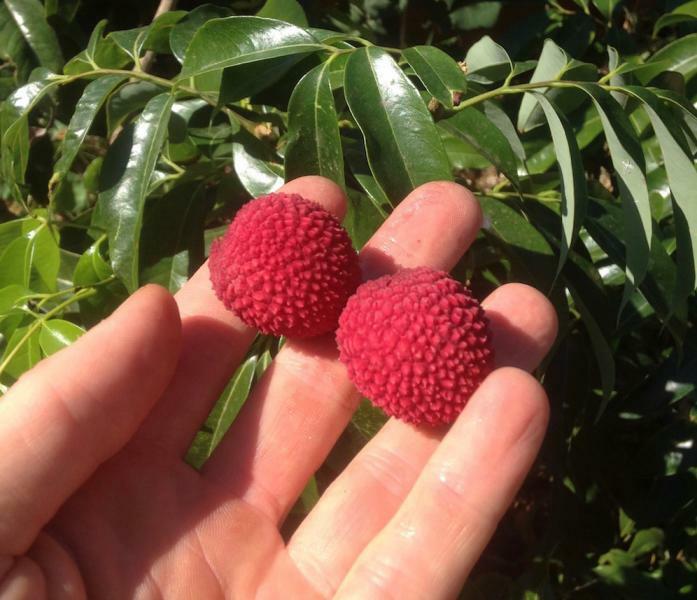 Water Lychees fairly frequently in the first couple years, like avocados, then moderately after that, like Citrus and many other fruits. 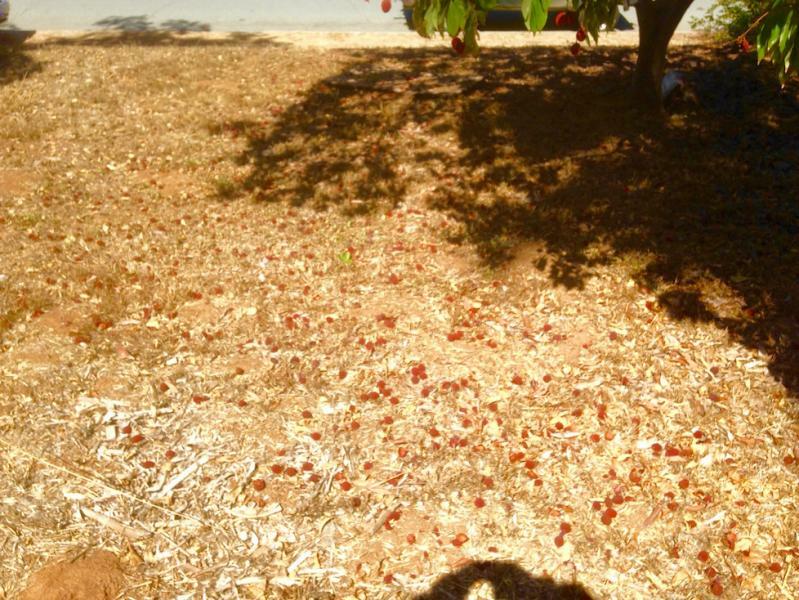 The fruit fall to the ground, and many of them dry nicely, still enjoyable edible and packed with sweet energy. 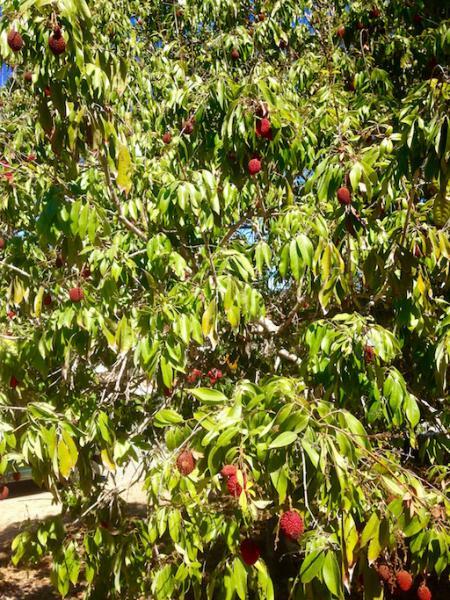 Though the fresh juicy fruits off the tree are generally preferred. Both are good though. 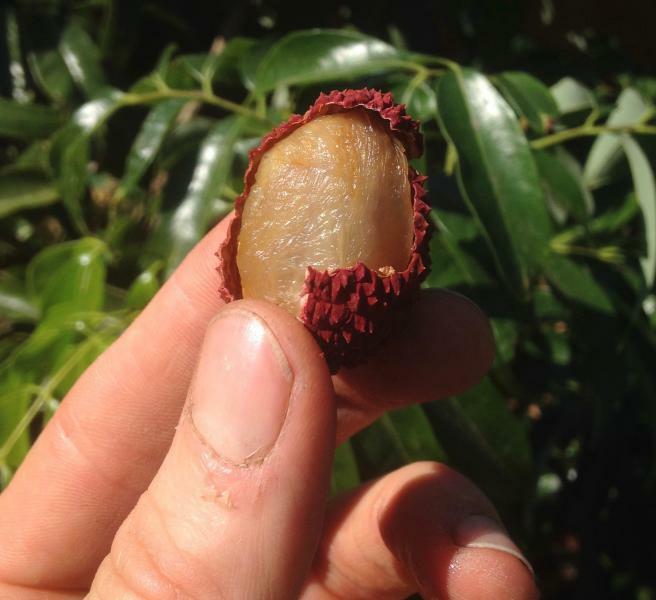 Photo below shows the seed and skin remaining after eating the flesh of the Lychee/Litchi. 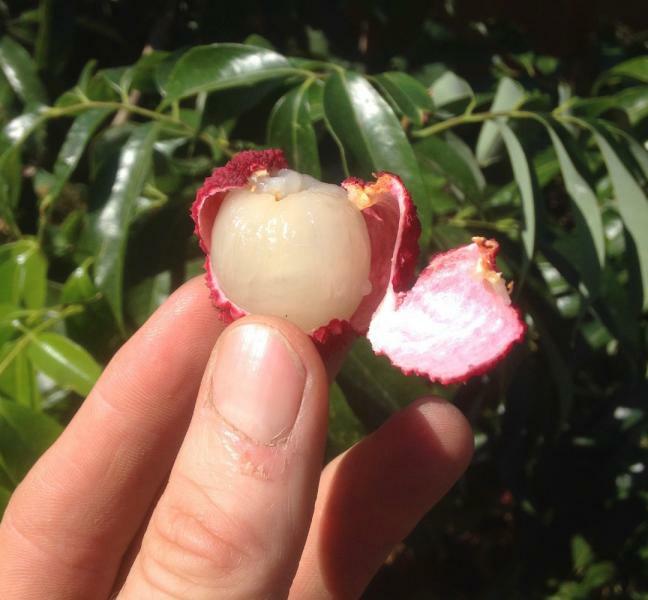 Photo below shows the fresh ripe unopened Litchi / Lychee fruit. The two photos below show gradation of natural drying process, which causes the sugars to become more concentrated, - good for eating and energy too. The top photo of the blog shows the flesh of the fresh ripe fruit, with it's white-buff-cream colored flesh.